Stage Electrics will be exhibiting at PLASA Focus Leeds, which takes place at the Royal Armouries on Tuesday April 30 and Wednesday May 1. This year on the Stage Electrics stand (RA-B18) there will be a range of audio, lighting, staging and video products that reflect the wide range of specialist equipment the company offers. New for 2013 will be a display of gas-based special effects from MAGIC FX. These gas based confetti and streamer effects are an ideal solution for venues with a restricted use of traditional pyrotechnics. New for lighting sees the introduction of the ilumo LED fixture by British manufacturer Lumonic. This clever and innovative solution which provides its users 12 high brightness RGBW OSRAM LED’s is ideal for lighting high definition broadcast, conferences and theatre. Other lighting equipment featured on the stand includes Chauvet, Martin Professional, Philips, ETC, GDS, Pulsar and Zero 88. Stage Electrics will also have on display staging products from Prolyte; video products from Panasonic and Roland and communication systems from Altair. In addition, there will be a selection of innovative DMX products from Swisson and exciting DMX mini winches by Wahlberg. The audio line-up for 2013 includes the recently released Halo line array compact system from EM Acoustics alongside their mini EMS51 speakers with an i8 sub. The new Roland M200i audio console and DiGiCo’s SD9 with UB MADI audio interface will also be live and available to demo throughout the event. Stage Electrics will also be featuring their own Stage Managers Desk illustrating the possibilities and features of a bespoke cue light and communication console. 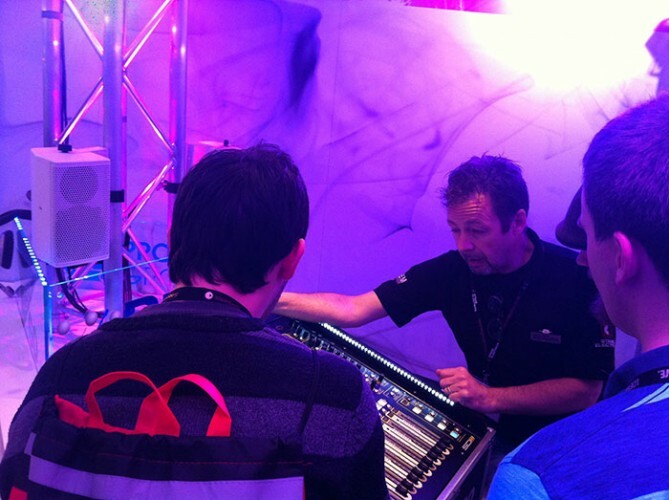 In picture: Jamie Gosney, business development manager- audio, demonstrates a DiGiCo console.